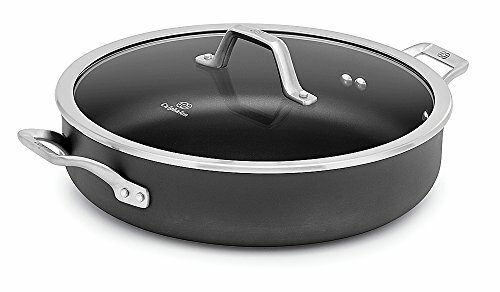 The Calphalon Signature Nonstick 5-Quart Sauteuse Pan with Cover is made with a Sear Nonstick surface that evenly sears, browns, saute and seals in juices when cooking meats, seafood and vegetables. This nonstick cookware surface is so durable that you can cook with metal spatulas, spoons and whisks, and it's also dishwasher safe for easy cleanup. Now, you can have it all - a metal utensil-safe nonstick that sears just like stainless. The large 5-quart Sauteuse nonstick sauce pan is great for brown-and-braise and one-pot meals, with beautiful brushed stainless steel loop handles so it fits easily in the oven.